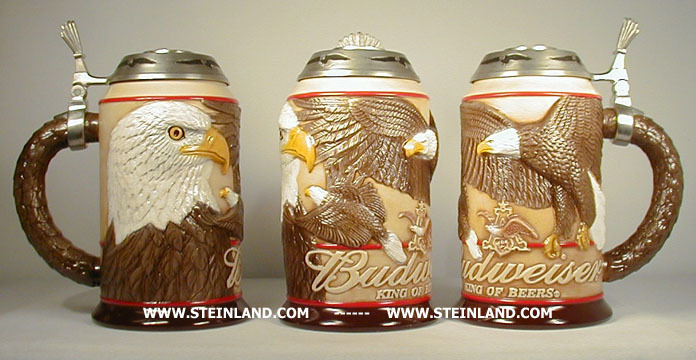 These are steins issued from Anheuser- Busch in or near the years 2004-2007 For further descriptions and shipping information, please contact Tony via phone or Email. To see a bigger picture click on the images below. Use your browsers back button to get back to this page. 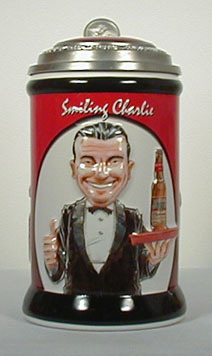 Smiling Charlie stein (CS-657) Very limited edition stein of just 1000 produced. Made in Brazil by Ceramarte. 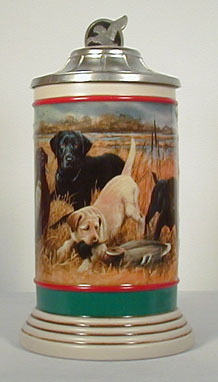 Dad's Pride and Joy (CS-645) First stein the new "Hunting Puppies" series. Limited Edition of just 2500. Made in Brazil by Ceramarte. World War II Stein (CS-589) Fourth stein in the "Historical Wars" series. Made in Brazil by Ceramarte. (CS-544) "World War I stein" Third stein in the ongoing "Historical Wars" series. Made in Brazil by Ceramarte. 1920-1969 Stein (CS-592) Second in the "Marketing Milestones" series. Made in Brazil by Ceramarte. 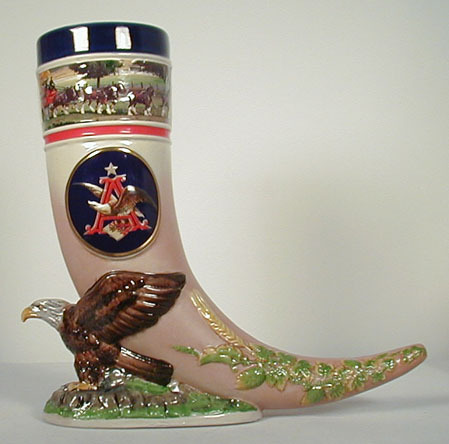 (CS-523) "1860-1919 Stein" First in the new series called "Marketing Milestones. Made in Brazil by Ceramarte. 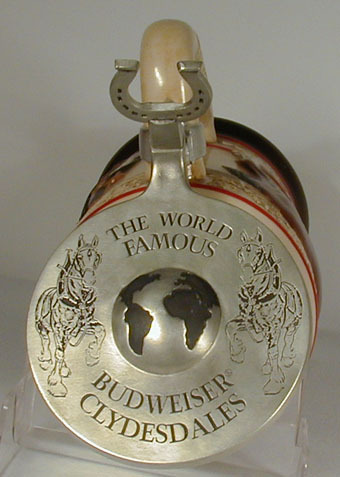 1890's Budweiser Barrel Wagon Stein (CS-524) First in a new series by artist Don Curran. "Early Delivery Days series". Made in Brazil by Ceramarte. Limited up to 5000. Pewter Barrel Stein (CS-495) 8 inch tall all-pewter stein produced by Walker of Sheffield. Awesome! Alcatraz Island Lighthouse Stein (CS-587) 11 3/4 inch tall stein. Made in Brazil by Ceramarte. Columbia Stein (CS-463) This is the first stein of a new series of two steins. Both will feature the beautiful mosaics that are displayed in the St Louis Brew House. 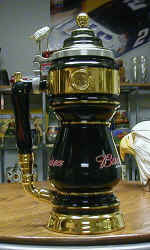 (CS-558) "Tradition of Quality Stein" New stein, 8" tall. Made in Brazil by Ceramarte. 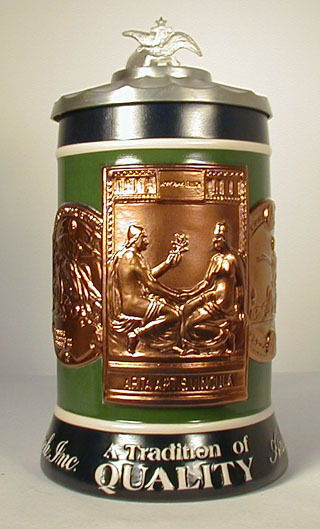 (CS-578) "2004 St Patrick's Day Stein" 7 1/2 inch tall stein made in Brazil by Ceramarte. (CS-578) "2004 Mardi Gras Stein" New stein to celebrate "Mardi Gras". 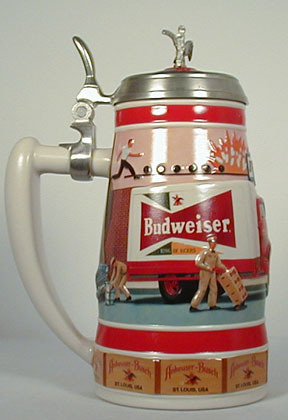 Budweiser Draught Tower II Stein ---AWESOME! (CS-542) Beautiful black and gold colors! 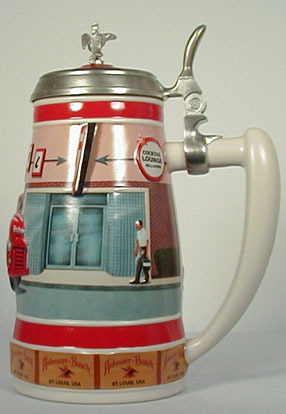 Limited Edition of up to 5,000 steins. 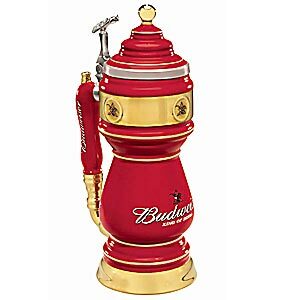 Budweiser Draught Tower III Stein ---AWESOME! (CS-615) Beautiful red and gold colors! Limited Edition of up to 5,000 steins. 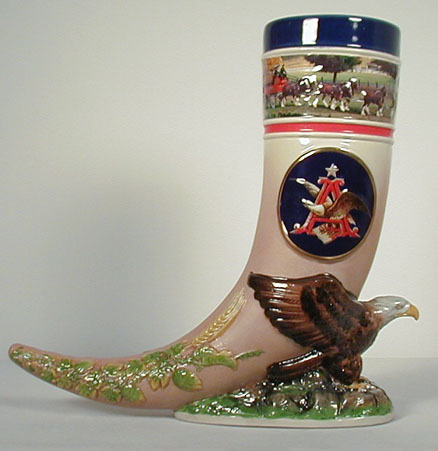 "Tradition and Heritage" Budweiser 2003 St Patricks Day Stein, (CS-531) 12th stein in series. 1936 Budweiser Logo Stein (CS-572) 6 3/4 inch tall stein, first in the new "Budweiser Retro Logo series". Pewter Bud Light Stein (CS-605) 6 inch tall pewter stein. Manufactured by Walker of Sheffield. 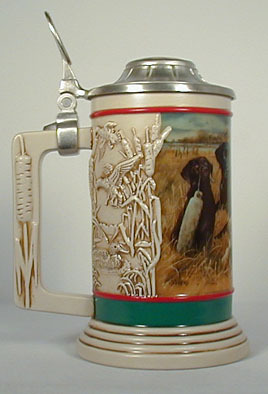 Third stein in the "Early Delivery Days" series. Designed by artist Don Curran. Made in Brazil by Ceramarte. (CS-583) "Summer Calendar Girl stein" Third stein in the Malt Nutrine 1906 Calendar Girl series. 11 1/2" tall. (CS-522) "Butch Cassidy and the "Hole in the Wall Gang" Stein" First in a new series of Famous Outlaws from the late 1800's and early 1900's. 2004 Budweiser Holiday Stein (CS-608) "The Budweiser Clydesdales" This stein celebrates the 25th Anniversary of the unlidded Holiday Series. 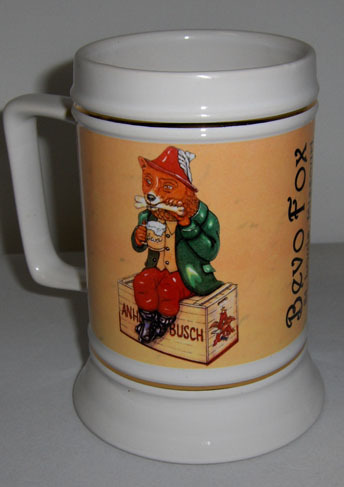 The artist for this stein is Lonnie Busch and it is produced in Brazil by Ceramarte. 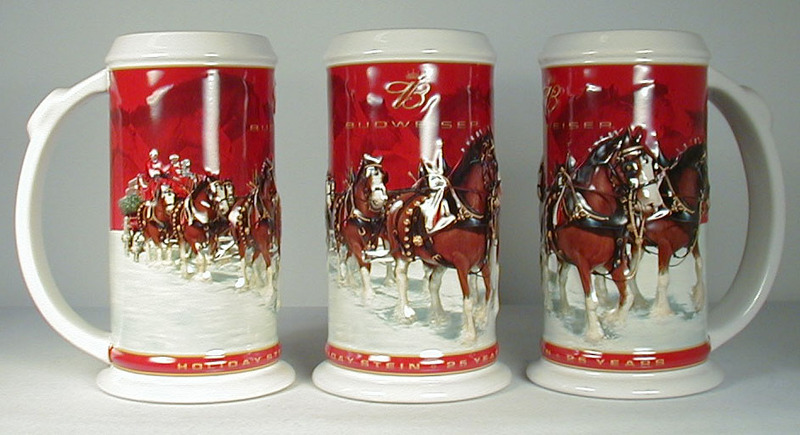 2004 Budweiser Holiday Lidded Stein Signature Edition (CS-608SE) "The Budweiser Clydesdales" This stein celebrates the 25th Anniversary of the unlidded Holiday Series. 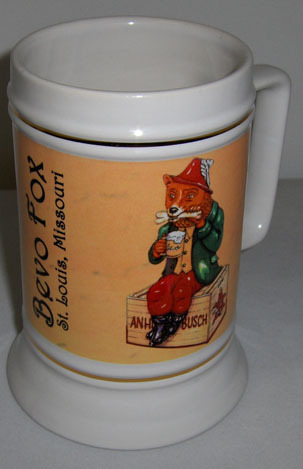 The artist for this stein is Lonnie Busch and it is produced in Brazil by Ceramarte. (View of Lid) (CS-539) "Soaring" Second stein sold as a "Special Event piece" at the International Collectibles Exposition in Rosemont, Illinois on June 27-29, 2003. 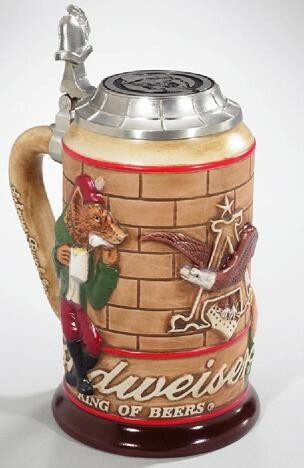 All 1500 of this extremely limited edition stein were sold out by 1:30 PM on Saturday. 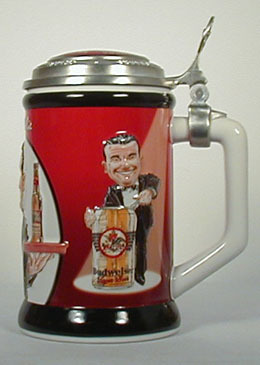 The demand for this stein was much higher than the supply. Designed by artist Jim Wainwright and made in Brazil by Ceramarte. 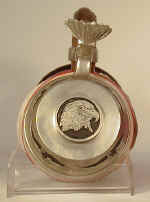 Measures 8 1/2" tall with beautiful pewter lid with eagle feather shaped thumbrest. 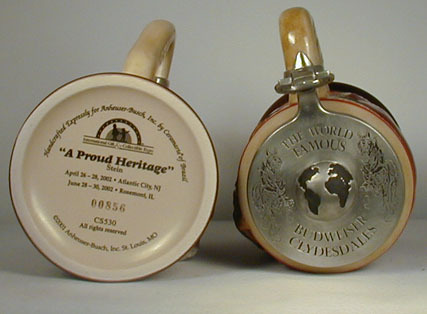 (CS-530) "A Proud Heritage" This stein was only sold to collectors in attendance at the International Collectibles Exposition in Rosemont, Illinois on June 28th, 29th, and 30th, 2002. Total distribution for this stein was limited to just 1500 steins! Bottom and Top View of CS-530 Comes gift-boxed with certificate of authenticity. "Independently Owned Anheuser-Busch Retailer. Anheuser-Busch and Retailer are not and shall not be considered as joint ventures, partners, agents, employees or fiduciaries of each other and neither shall have the power to bind or obligate the other"